Local Enterprise Partnerships were established in 2011 as part of the Government’s economic development plans. There are now 39 LEPs throughout the UK and their common aim is to build links between businesses and various support organisations, including local authorities, Chambers of Commerce and specialist advisors. In addition, LEPs can help businesses to access commercial and public funding, and should also play a role in representing the interests of local business to generate the conditions which will help to stimulate growth. Our client, Liverpool City Region Local Enterprise Partnership (LCR LEP), is one of the largest LEPs with 500-plus members. When the organisation needed to develop a ‘Local Growth Hub’ – a website which enabled businesses to access a range of online services – we were only too pleased to help. After all, we had already designed and developed the LEP’s highly successful AdviceFinder.co.uk service some two years previously and this would act as the blueprint for the Local Growth Hub. 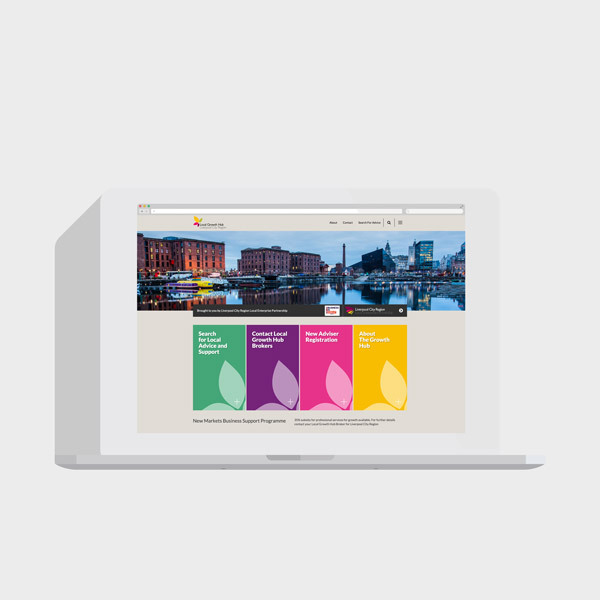 Our brief was to create a Local Growth Hub web site for the Liverpool City Region which would engage the area’s business community and facilitate partnerships between growing businesses and various support services. We wanted to build on the success of the AdviceFinder.co.uk service, creating a simple, intuitive site which was sufficiently sophisticated to allow support organisations and service providers to be properly profiled and for participating businesses to easily find out about the support available to them. We wanted to show that LCR LEP was serious about helping businesses to succeed with as little red tape and bureaucracy as possible. As such, we needed to ensure the design and structure of the site was simple and straight-forward, while rich in opportunities and information. Because of the high number of service providers available in the Liverpool region, it was important that the site took users through a validation process so that only the support which they were likely to be eligible for was presented. To encourage businesses to use the Local Growth Hub it was extremely important to present a deep level of relevant information about the business support organisations and specialist service providers without making the site unwieldy to navigate or the pages too lengthy and cumbersome to read. Once businesses enter the Growth Hub, they are able to source local advice and support or contact local growth hub brokers. Potential advisers or partner organisations are also invited to register their interest in providing business support services direct from the home page. Those wishing to access local advice and support – the majority of visitors to the site – are asked a series of questions which help to filter the results which are presented. The aim is to ensure visitors see relevant information which matches their exact needs. The user journey begins with a requirement for the visitor to specify whether they are a start-up/young or a growing/established business. They continue through up to 5 pages of quick-to-choose options before being presented with high quality search results. Search results, which can be further filtered according to geographical location, include a profile of the individual or organisation which can provide the support the user is looking for. The profile is sufficiently detailed to include information about the specialist services available from the provider, and the industry sectors which the provider has experience in. Service providers and potential partner organisations are able to register their interest in working with LCR LEP by completing a simple online form. This form triggers a validation process whereby the service provider is approved and their online profile is created without adding any unnecessary administrative burden or delay. The Local Growth Hub for Liverpool is a clever site which works hard both for growing businesses and for service providers alike.